Ford Hopes New Mustang Will Get The World's Motor Running : The Two-Way The option of a smaller engine size and the car's sleeker design are two features analysts say are geared toward helping the Mustang appeal to buyers overseas. 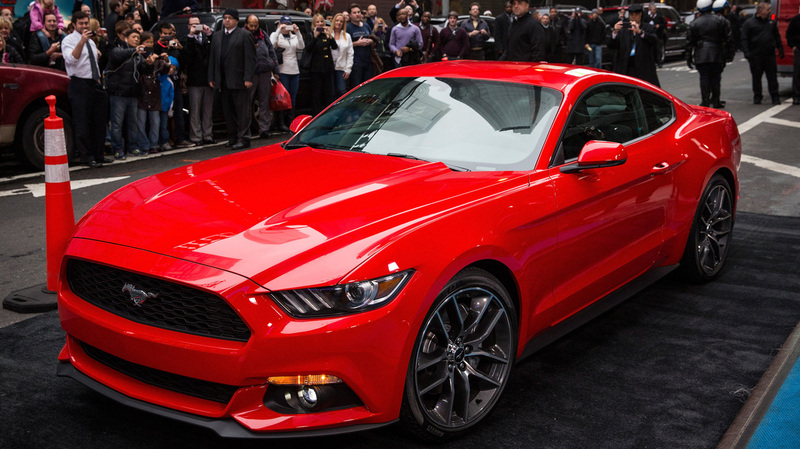 The new 2015 Ford Mustang was unveiled Thursday. The car's new design includes features that are geared toward global markets. Ford unveiled its new Mustang on Thursday, in a splashy event that was undermined a bit by leaked photos that showed the new model's design. And the Mustang will be sold around the globe for the first time since the car was introduced nearly 50 years ago. "Ford designers say they took design cues from Mustang's heritage, especially the 1967 Fastback. Mark Fields is Ford's Chief Operating Officer. He says Ford didn't need to take global tastes into account because the Mustang already has universal appeal. 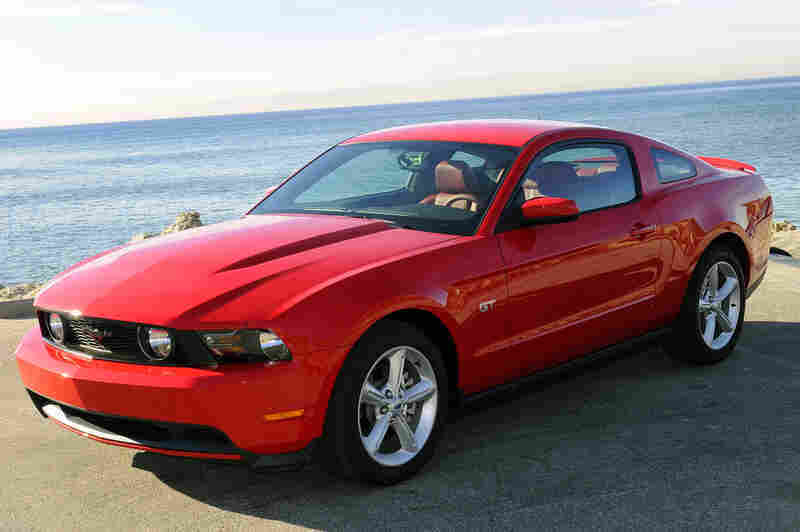 "Ford will offer a four-cylinder Eco-boost engine in the Mustang along with the traditional V-6 and a V-8. The car will go on sale next fall." Reacting to the 2015 Mustang, several media outlets noted Ford's attempt to balance the car's iconic standing as an American muscle car with practical concerns such as fuel economy — which could make it a tough sell in international markets with high gas prices. "The offering of a four-cylinder turbo engine signals a clear shift toward modernity and fuel economy," writes Jerry Hirsch at The Los Angeles Times, "though today's technology gives that small power plant a whopping 305 horsepower — equal to that of the vaunted 289 V-8 that powered the 1966 Shelby Mustang." Popular Mechanics says the new car "has left many of the retro design cues in the past." The look "is clearly more aggressive," says Leftlane News. The option of a small engine size and the car's sleeker design are two features that analysts say are geared toward helping the Mustang appeal to buyers overseas. But as several Mustang fans in Germany told Tracy for a report for All Things Considered, not all foreign buyers are tempted by smaller engines. "You put the window down, and the arm outside, and you hear the V-8 engine. ... It's very cool," Timo Schneider said. Others say they're still drawn to the car's heyday, which began in the 1960s. 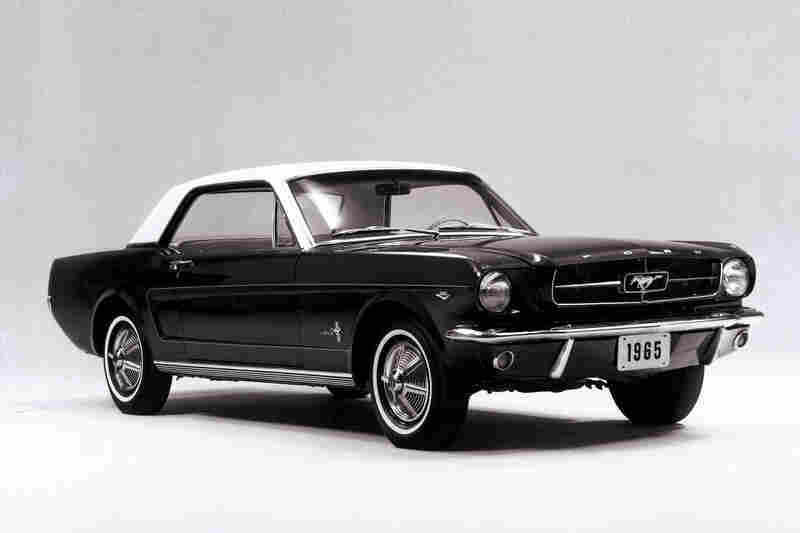 Ford introduced the Mustang, billed as a "low-priced, four-passenger sports car" in April 1964. Its sporty look and peppy performances gave it strong appeal to youthful car buyers. The first generation of Mustangs lasted until 1973. 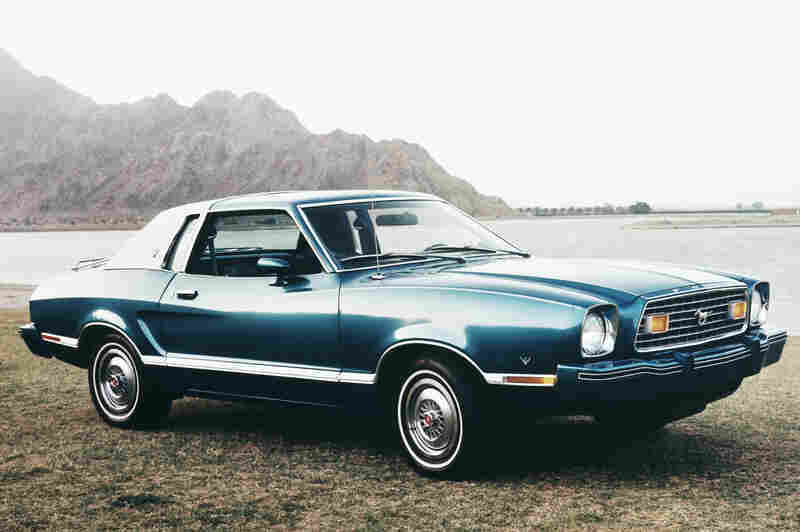 Seen here is a new 1976 Ford Mustang, part of the second generation of Mustangs that lasted from 1974 to 1978. 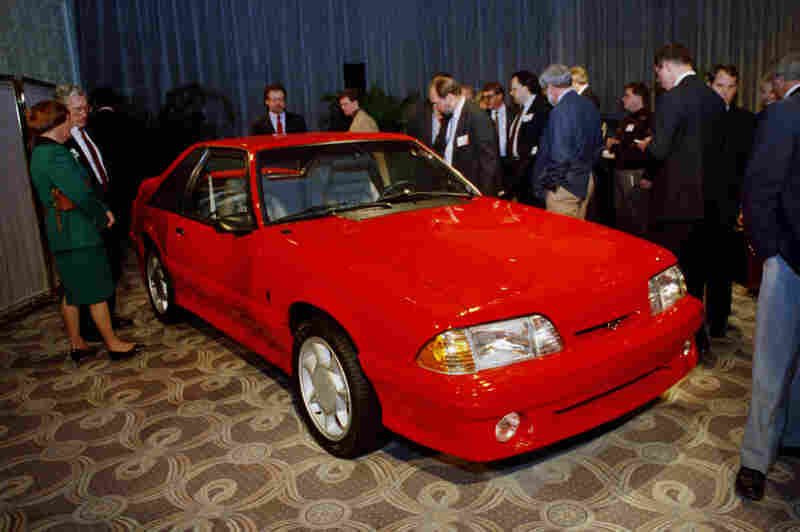 Reporters look over the limited edition 1993 Ford Mustang Cobra after its unveiling Feb. 6, 1992, in Chicago. This was part of the third generation of Mustangs that were produced from 1979 to 1993. 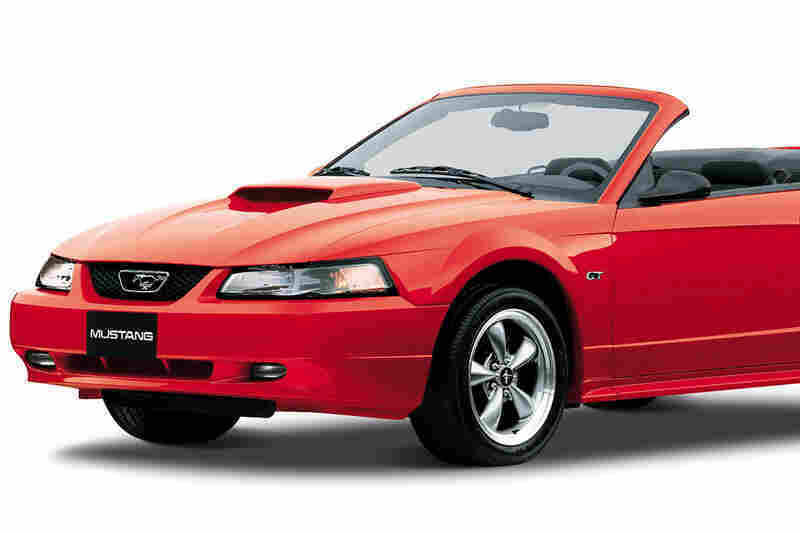 The 2002 Ford Mustang GT Convertible is shown in a handout photo from the Ford Motor Co. in Dearborn, Mich. The fourth generation of Mustangs lasted from 1994 to 2004. The 2010 Ford Mustang, part of the fifth generation of Mustangs lasting from 2005 to 2014. "For me, it started in childhood," says Michael Sommer. "That Mustang Mach 1 from 1973, I think, that's a dream car — that's the dream!"